From the masters of paranormal romance, three brand-new tales of seduction…The Darkest Angel by Gena ShowalterA Lords of the Underworld taleAn iron-willed demon assassin, the angel Lysander has never known lust—until he meets Bianka. 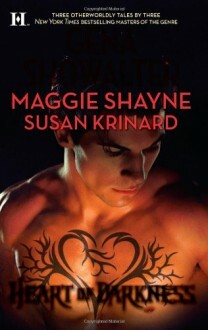 Spawned from the bloodline of Lucifer, the beautiful but deadly Harpy is determined to lead the pure-hearted Lysander into temptation….Love Me to Death by Maggie ShayneTwenty-two years ago four teenage boys were convicted of a young girl's murder. Now, in the form of a beautiful woman, the "victim" is seeking vengeance. And only one man dares to dig into the past to uncover its secrets… and set her free.Lady of the Nile by Susan KrinardLady Tameri believes herself to be the reincarnation of an ancient Egyptian princess, and Leo Erskine has set out to prove her wrong…never dreaming that the two of them are about to discover a prophecy that will bind them together forever. For some reason the Darkest Angel continues to be my favorite lords of the underworld story.